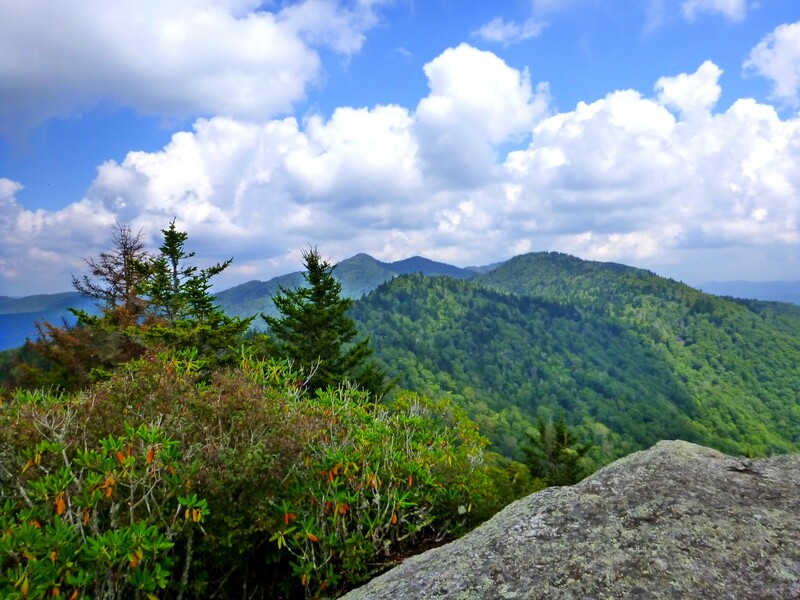 Two or three times a week, I hike in the nearby Plott Balsam range for exercise—and for more intangible reasons. I feel very fortunate that, living in Sylva NC, I have these mountains so close. The Plotts represent the divide between the Tuckasegee River (I live with the Tuck right on my doorstep) and the Oconaluftee, over by Cherokee. They lie just southeast of the Smokies. The Plotts boast five summits higher than 6000′. As suggested by the name, fragrant balsams flourish all along their crest. The other part of the name, “Plott,” comes from a prominent family of German descent that settled in the area and also gave their name to a breed of hounds. The town of Sylva has created a park out of what used to be property developed for the municipal water supply on Fisher Creek. The lowest part of the park lies at 3000′. From there you have a choice of going up the West Fork or the East Fork of Fisher. 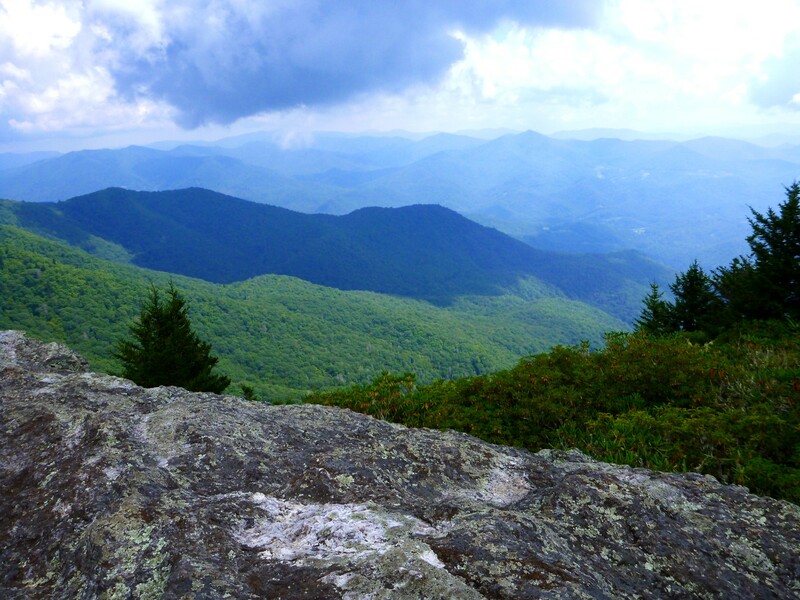 Either way can lead to Blackrock Mountain (5810′) and, if you are ambitious, on along the crest to Waterrock Knob on the Blue Ridge Parkway. You might want a car shuttle for that. There are many variations, but I much prefer the East Fork to the West, which follows an old rubbly road. 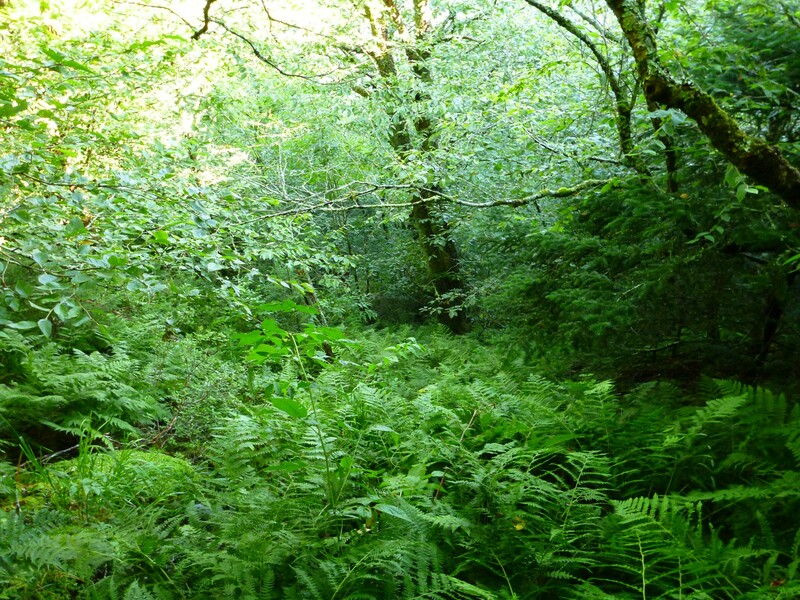 The East Fork is an overgrown footpath that climbs steeply (800′ vertical in a little more than a half mile) along a beautiful stream. My most frequent exercise options are to climb 1000′ vertical, 1400′, or 1700′ along the East Fork and descend the same way. 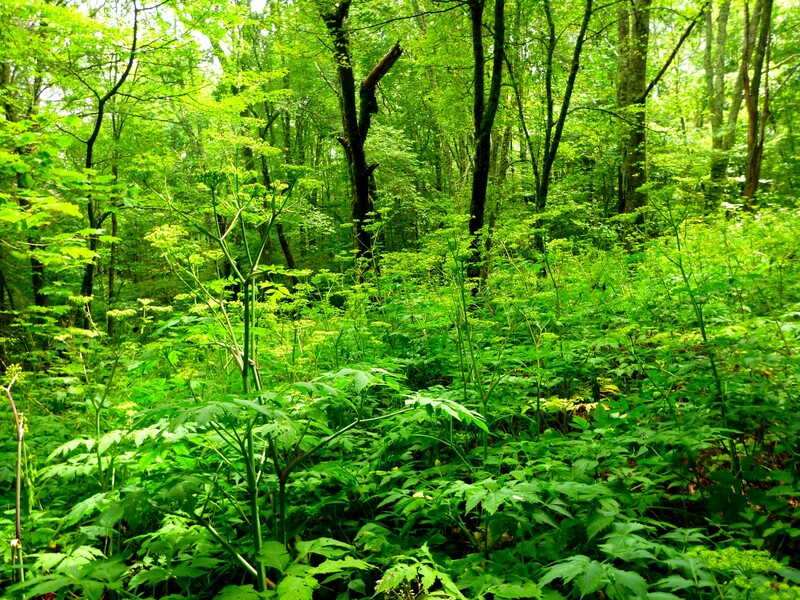 Now, in late summer, I have to bushwhack a short distance to avoid a thriving patch of knee-high poison ivy, since I’m so allergic that even if I wear long pants, the toxic juice on the fabric would attack me. A couple days ago I made the 2800′ vertical, 8-mile round trip hike to Blackrock, which I don’t do all that often. 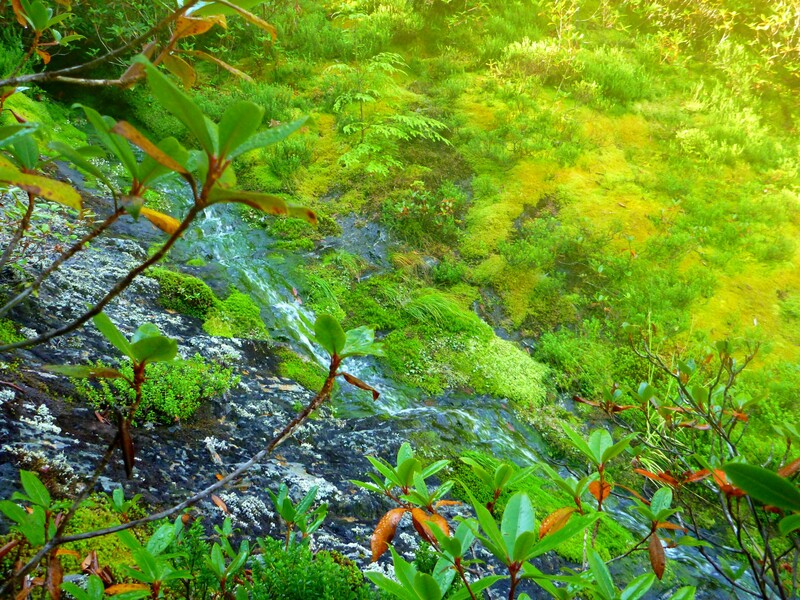 It’s a fairly strenuous hike whose last section climbs 800′ in less than half a mile. You feel impressed with yourself for doing it until you hear about the “Assault on Blackrock” trailrunning race in which people have done the whole thing, round trip, in 1 hour 30 minutes. That boggles my mind. It takes me about two hours longer. Oh well, that must be because of the time I spend lingering on the summit! Going up to Blackrock via the East Fork, you climb steadily to around the 5000′ level, and then head east 0.7 miles along an old roadway that contours around. That is your breather. You then exit the easy stuff and climb up a rough footway over boulders to the ridge of the balsams. From this point on, the trails are just old manways not laid out by anyone aiming at systematic trail construction. You top out on the ridge, catch your breath, and continue past a rock crag that is not the true summit, though you can climb it either by making creative use of a dead tree leaning against the rock or going around to the other side and scrambling up a crack. Toward the true summit, a multitude of rough paths veer in various directions. 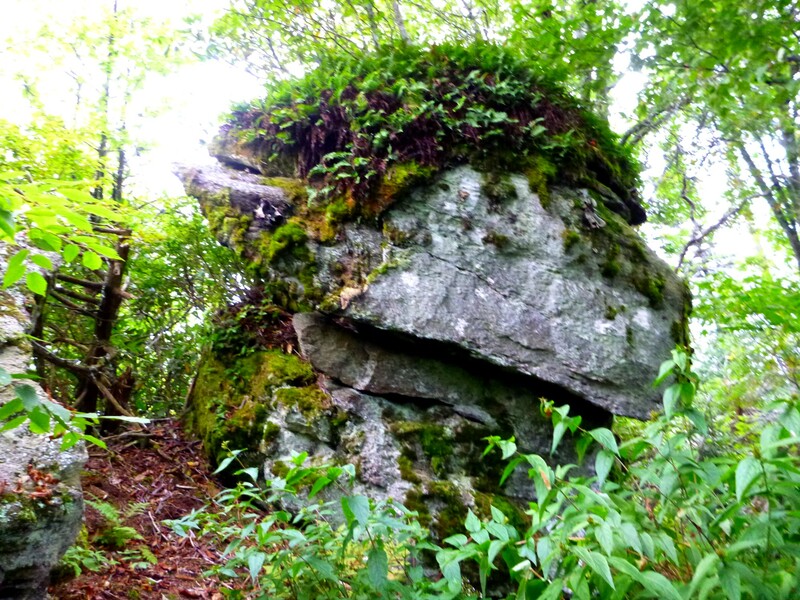 The one I chose the other day led to a vertical outcrop that I traversed while clinging to laurel branches. That was not the easiest way. There is a fairly simple way over toward the northeast side of the crag. I will return to this subject and post more photos, but for now here are a few pictures. From Blackrock summit looking toward Yellowface and Waterrock. The side ridges plunge thousands of vertical feet. At the moment, Filmy Angelica is the ascendant wildflower above 4500′. But the Plotts are just loaded with wildflowers—and with mushrooms of all shapes, sizes, and colors (I’ve found morels there earlier in the season). 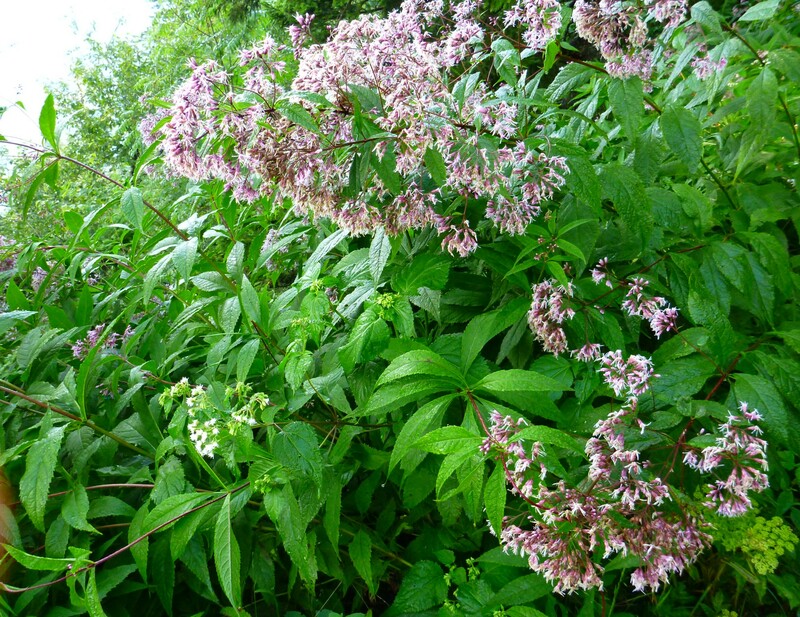 For the season of flaming azalea and laurel, I’ve written about it on my other blog, here. Peculiar rock near Blackrock summit. Lots of peculiar rocks reside up there. 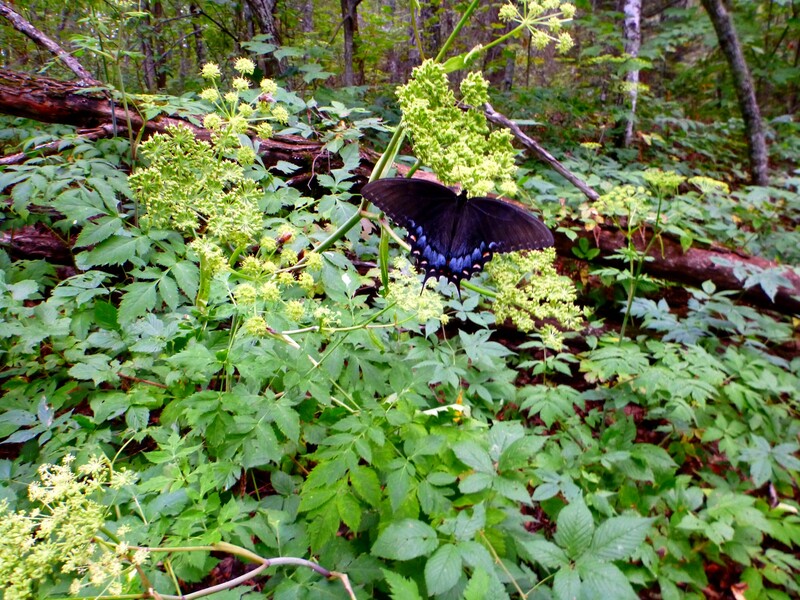 The same butterfly as at top, entranced by its flower. Posted by Jenny in history, memoir, railroads. 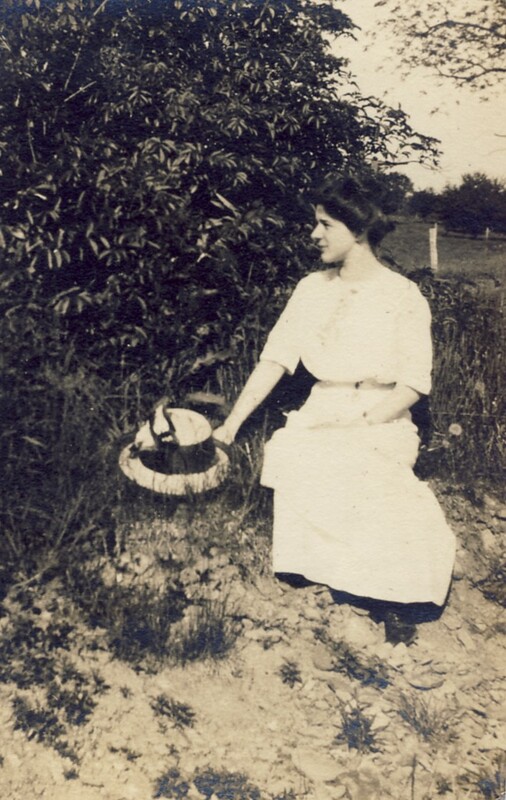 This is taken from a memoir entitled “When I Was a Girl” by my grandmother, Sybil Crowninshield Kennedy Bennett. The series starts here and alternates every other post. Cato village had at its greatest size nearly six hundred population. [The number was closer to 400 when Grandma was growing up. The figure stood at 532 in 2010.] It was on the Fair Haven branch of the Lehigh Valley railroad. There were six passenger trains a day from Auburn to Fair Haven in the summer and four in the winter. The mail all came on the trains and all packages came by express on the trains as there was no Parcel Post even as late as when I was in college [it was established in 1913]. Going to meet the trains was a free entertainment, which we were not allowed to enjoy unless we knew someone going or coming. We did manage to accompany to the train and to meet quite a few people. After the train came in, people went to the post office, where the mail was distributed and put into boxes. Each family had a box and a number, either a pigeonhole where you had to ask for your mail at the window or a lock box to which you had a key. It took a half hour or more to distribute the mail. The post office was in a large store and became really crowded with people who were usually talkative and full of jokes. We didn’t get to attend this rite very often, either, but sometimes we could, when there were other errands to the store or we expected mail. The Postmaster’s wife usually helped him and she accommodatingly read the post cards to her edification and would ask someone to “tell Mrs. Jones that her sister would be coming Thursday,” or some such message. [The train trip was an important feature of an annual picnic.] 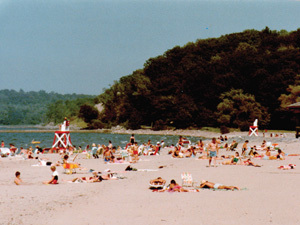 The Cato churches, all three, organized and held a famous Sunday School picnic at the Picnic Grounds in Fair Haven [on Lake Ontario] every year. It was held on the last Thursday in August. The church people took extra food for those who had none and there were railroad tickets too for the people who couldn’t buy them. The big thing was the special train which came at nine o’clock in the morning. It had previously taken on passengers at Auburn, where it started, and at Weedsport. At Cato it really filled up. There were at least fourteen coaches, crowded to the platforms. There were those who sat down on the red plush seats and rode looking out the windows and those who walked through the train locating and visiting with friends. The Cato band always went and gave a concert, playing at the Cato station and the Fair Haven one and at the picnic. You can’t imagine the enthusiasm and excitement of all this and the disappointment if it rained. Rail service to Cato village ended in 1953. 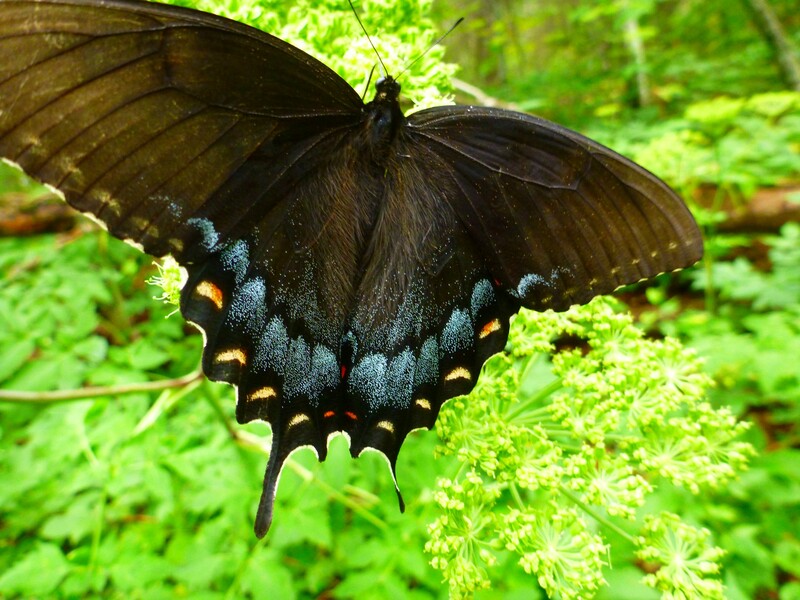 Posted by Jenny in bushwhacking, Life experience, Smoky Mountains. In late May, I went down one of the Middle Crag gullies (there is one on each side of the ridge) with a couple of friends. 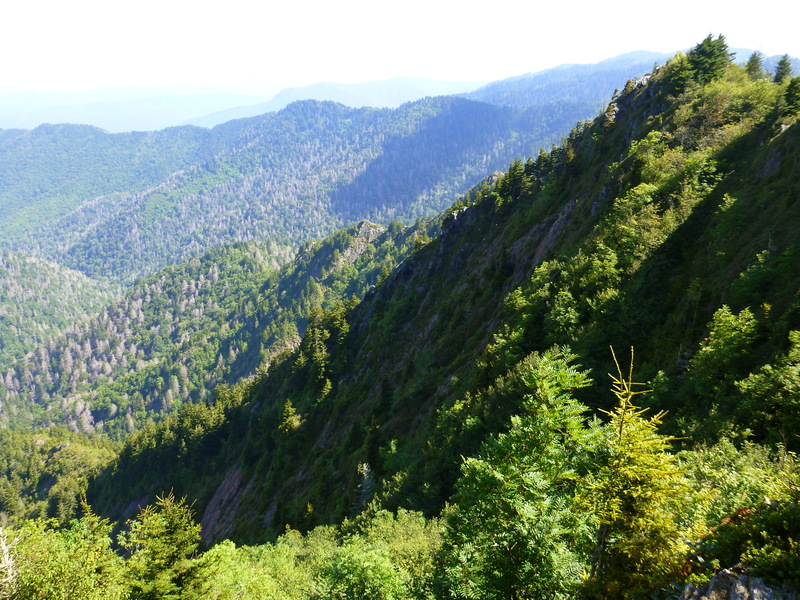 Toward the bottom, I had a recurrence of a knee problem (it pops out of joint) and ended up descending to the Greenbrier and hitchhiking around to Newfound Gap, where we had started. My two friends climbed up the crag and returned via the A.T. to Newfound. You can see some wonderful pictures from that trip that my friend Chris took here. Ever since then, it bugged me that I didn’t climb the crag. A week ago I returned by myself with the goal of repeating the route my friends had taken. I was not successful. But I did have an interesting experience. It was a beautiful day as I hiked out from Newfound Gap. I stopped and took the picture you see above. Continuing around a crescent-shaped side path, I returned to the A.T. and went east a bit further to hit the top of the gully we’d gone down the other time. But I went too far east. I should have dropped into the gully immediately after hitting the A.T. past the side path. 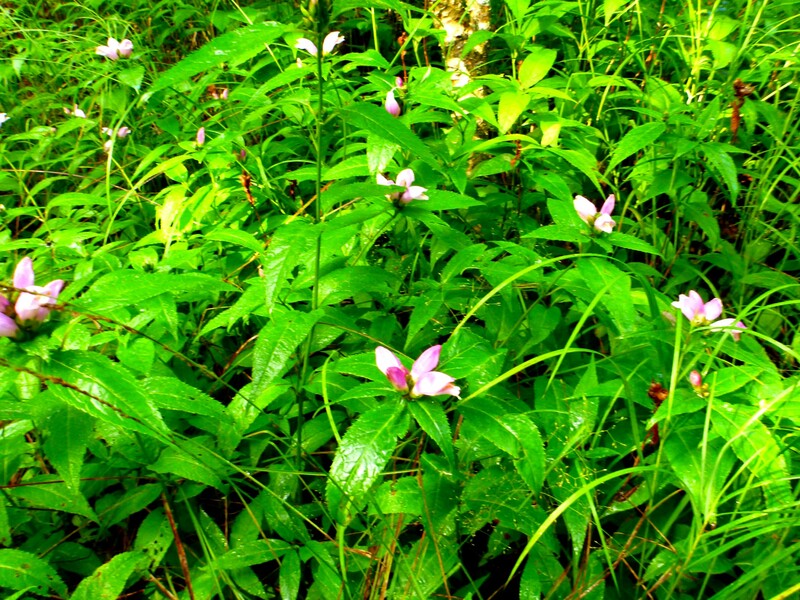 On my way out the A.T., I saw some nice pink turtleheads. Leaving the A.T. to enter what I thought was the same gully we’d been down before, I passed through familiar-looking forest. It dropped off steeply, as I expected. 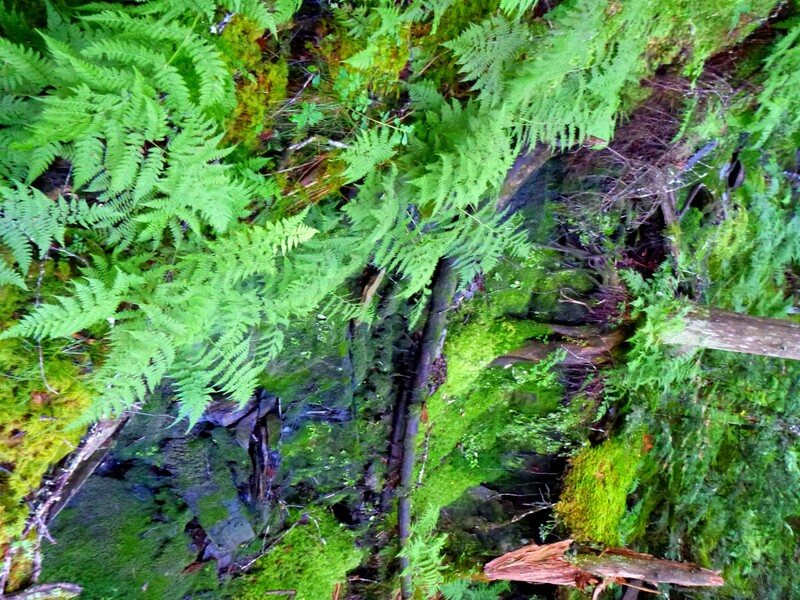 Mossy cascade just above the precipitous section. But things didn’t look quite right. The rock was a grayer color than the pink that had predominated in the other gully. I thought perhaps I simply wasn’t remembering things correctly. I worked my way down carefully from the starting point of around 5500′ to 4700′. And there I could see I’d gone distinctly wrong. 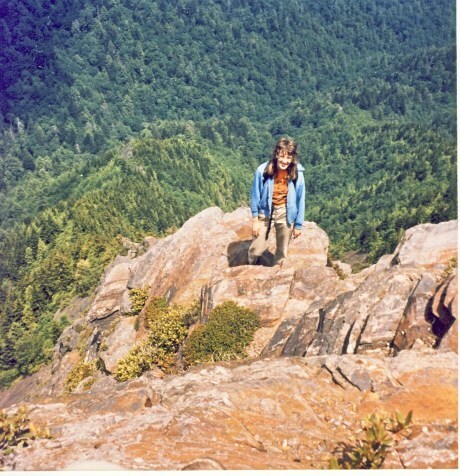 The drop was much steeper than anything in the other gully—which had been steep enough that I’d slid down much of it on the seat of my pants. Here, on the map, you can see the situation. The red line represents the route I took. The blue line represents the way we’d gone before. My ruler against the scale on the USGS quad shows me that the distance between the two at the top is 1/10 of a mile. You see what happens in the red gully between 4800′ and 4600′. Obviously, I had to go down the left side of the draw rather than the right. It was steep sidehilling, but I worked my way along, making use of the rhodo and laurel for handholds. It was difficult for me. I looked up to my left to see if I could simply head up to the ridge, but it looked steeper than I wanted to attempt. I wish I could think of some dramatic reason why I decided to turn around, climb back up, and call it a day—but I can’t. I simply lost heart. 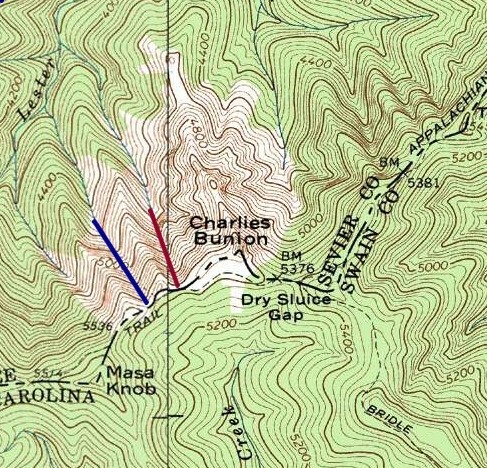 From the comfort of my living room, I can see that if I’d just been able to get down a couple of hundred feet lower, I could have gone up to the ridge—or I could have gone down to Lester Prong and around the base of the ridge to the second tributary (the bottom of the correct draw). I am sure this would not have been a problem for many other people. It is very hard for me to be honest about this, but I must be. One of the things I’ve realized as a result of this experience is that I can do some kinds of bushwhacking solo, but some things I can’t. Oddly enough, I have climbed the adjacent ridge to the east by myself, which some would call harder than Middle Crag, but in that case I wasn’t dealing with going down a gully, I was climbing upward, which for some reason felt more comfortable to me. Another thing I realize is that I can do things with other people that I can’t do by myself. This is hard for me to admit, because I’m an independent sort of individual. I have done the climb below with another person, but I don’t think I could do it by myself. With the moral support of another person, I could do this.